Salem's Lot was Kings second published novel, following on from his success with Carrie. 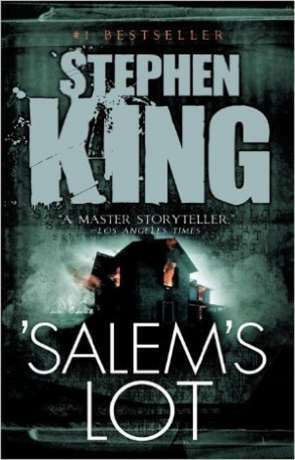 Written shortly after King moved to Maine (the bulk of the story was actually written before Carrie), it follows the writer Ben Mears as he moves back to the small town of Jerusalem's Lot (known locally as Salem's Lot, a fictional small town in Maine). Ben spent part of his Childhood in Salem's Lot and from the outside, little seems to have changed. That includes the derelict property known as the "Marsten House" which was at one time the residence of infamous hitman Hubert "Hubie" Marsten and has a dark history all it's own. Shortly after Ben moves to Salem's Lot, the house is bought by Kurt Barlow and Richard Straker - strangers to the town and strange in nature. Then kids start to go missing. Salem's Lot is a slow build, it takes time to introduce the major characters, which includes the town itself. Hints at what to come are plentiful for the keen observer however, with some clever descriptions alluding to the vampire long before they bare their fangs. These blood suckers don't make an appearance till the second half, after which point the pace picks up substantially. It doesn't take long for the sticky brown stuff to hit the softly spinning blade. Once it does, life in "The Lot" deteriorates rapidly with town being steadily taken over by creatures of the night. It becomes unsafe to venture outside in the dark and those that died earlier begin preying on the living. It's a big shock after the meandering, sedate pace of the first half and delivers all the more power as a result. It's easy to imagine how a small, remote town could be taken over so fast and unseen in an age before social media, email and text - a time when the only foms of distance communication were letter or phone. Salem's Lot can also be seen as an allergory to the slow death of small town america of the 1970's, caused in part by large-scale comercialism and declining rural populations. One of the things I love about King's novels is that even though we do have a big bad evil to focus on, it's often the individual evil of humanity itself that shocks with a large part of the Lot's population seemingly up to no good. As is King's style, it's a dark and gritty tale with an over-abundance of human weakness and resulting horror. The quality of the writing is good, especially when considering this book was his second published novel, it already has it's fair share of "Kingism". In the 1990's King was quoted in an interview with Phil Konstantin for The Highway Patrolman magazine as saying that he had "a special cold spot in my heart" for Salem's Lot. It was nominated for a World Fantasy Award in 1976 and in 1987 was nominated for the Locus Award for All-Time Best Fantasy Novel. It's been adapted for Radio and TV twice. King has also explained that a sequel was always planned but that the Dark Tower novels of Wolves of the Calla and Song of Susannah continued this narrative. Salem's Lot remains a classic horror tale. The slow burn and then rapid deterioration. The dark atmosphere of the town even before the introduction of the undead. Kings' unique style of writing. All contribute to a powerful vision of a dying American town and the fragility of humanity. Written on 29th January 2018 by Ant.